Robert Keenan Winery is located near the top of Spring Mountain District, high above the beautiful Napa Valley. The Keenan estate is set on the site of a defunct turn of the century winery renovated by Robert Keenan in 1974. The mountain estate is comprised of 48 acres of vineyard, and a historic stone winery. Keenan has been producing wine since 1977, and is known for making small lots of intense, concentrated Cabernet Sauvignon, Merlot, Cabernet Franc, Chardonnay, and Zinfandel. We offer a very personal, casual tasting along with a selection of cheeses to be paired with our wines. To join the wine club, visit www.keenanwinery.com or call 707-963-9177. 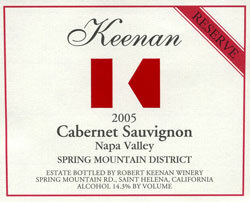 Members of the Keenan Wine Club receive a 20% discount on all Keenan wines. Club members receive semiannual shipments; 4 bottles in November and 4 bottles in April. 10% discount on wine and merchandise. Keenan Winery is certified under the Napa Green Winery Program by the Napa County Department of Environmental Management (DEM) and the Association of Bay Area Government’s (ABAG) Green Business Program and completed all the regulatory components needed for environmental sustainability. These components included developing water and energy conservation methods, preventing pollution, and reducing solid waste. In addition to developing sustainable winery practices, this program is set to become the standard for the state of California. Keenan Winery is certified under the Napa Green Certified Land Program. Keenan Winery has created and implemented a customized farm plan with measured results that addressed all aspects of its property, vineyard land as well as non-farmed land, including practicing soil conservation, water conservation, stable drainage, riparian corridor enhancement, fisheries and wildlife habitat enhancement and long-term improvement and sustainability.